A foundational HA setup, created by Red Hat OpenStack Platform 13 Director, that you can use as a reference model for understanding and working with OpenStack HA features. HA features that are used to make various services included in Red Hat OpenStack Platform 13 highly available. Examples of tools for working with and troubleshooting HA features in Red Hat OpenStack Platform 13. The following figure shows the configuration that was created specifically to test the high availability features described in this document. For details on how to recreate this setup so you can try the steps yourself, see the Appendix A, Building the Red Hat OpenStack Platform 13 HA Environment appendix. In a High Availability (HA) deployment, there are four types of services: core container, active-passive, systemd and plain container. Core container and active-passive services are launched and managed by Pacemaker. All other services are managed directly by systemd with the systemctl command or by Docker with the docker command. Core container services include Galera, RabbitMQ, Redis, and HAProxy. These services run on all controller nodes and require specific management and constraints for the start, stop and restart actions. Active-passive services run on a single controller node at a time, and include services such as openstack-cinder-volume. Moving an active-passive service must be performed using Pacemaker, which ensures that the correct stop-start sequence is followed. Systemd and Plain Container services are independent services expected to be able to withstand a service interruption, and should not require you to to manually restart any service, such as neutron-server.service, or any container, such as openstack-nova-api-docker, if you restart Galera. When orchestrating your HA deployment entirely with the director, the templates and Puppet modules that are used by the director ensure that all services are configured and launched correctly, particularly for HA. In addition, when troubleshooting HA issues, you need to interact with services using the HA framework, the docker command, or the systemctl command. Red Hat OpenStack Platform employs several technologies to implement high-availability. High availability is offered in different ways for controller, compute, and storage nodes in your OpenStack configuration. To investigate how high availability is implemented, log into each node and run commands, as described in the following sections. The resulting output shows you the high availability services and processes running on each node. Pacemaker: By configuring virtual IP addresses, containers, services, and other features, as resources in a cluster, Pacemaker makes sure that the defined set of OpenStack cluster resources are running and available. When a service or an entire node in a cluster fails, Pacemaker can restart the resource, take the node out of the cluster, or reboot the node. Requests to most of those services is done through HAProxy. HAProxy: When you configure more than one controller node with the director in Red Hat OpenStack Platform, HAProxy is configured on those nodes to load balance traffic to some of the OpenStack services running on those nodes. Galera: Red Hat OpenStack Platform uses the MariaDB Galera Cluster to manage database replication. Active/active: In this mode, the same service is brought up on multiple controller nodes with Pacemaker, then traffic can either be distributed across the nodes running the requested service by HAProxy or directed to a particular controller via a single IP address. In some cases, HAProxy distributes traffic to active/active services in a round robin fashion. Performance can be improved by adding more controller nodes. Active/passive: Services that are not capable of or reliable enough to run in active/active mode are run in active/passive mode. This means that only one instance of the service is active at a time. For Galera, HAProxy uses stick-table options to make sure incoming connections are directed to a single backend service. Galera master-master mode can deadlock when services are accessing the same data from multiple galera nodes at once. As you begin exploring the high availability services described in this document, keep in mind that the director system (referred to as the undercloud) is itself running OpenStack. The purpose of the undercloud (director system) is to build and maintain the systems that will become your working OpenStack environment. That environment you build from the undercloud is referred to as the overcloud. To get to your overcloud, this document has you log into your undercloud, then choose which Overcloud node you want to investigate. From there, you can interact with either the undercloud and overcloud by loading the corresponding environment variables. For general information about accessing either the undercloud or the overcloud, see Accessing the Overcloud. In your own test environment, even if you use the same address ranges, the IP addresses assigned to each node might be different. After logging into a controller, compute, or storage system, you can begin investigating the HA features there. In the OpenStack configuration described in Figure 1.1, “OpenStack HA environment deployed through director”, most OpenStack services are running on the three controller nodes. To investigate high availability features of those services, log into any of the controllers as the heat-admin user and look at services controlled by Pacemaker. Output from the Pacemaker pcs status command includes general Pacemaker information, virtual IP addresses, services, and other Pacemaker information. Number of nodes that are configured for the cluster. Number of resources that are configured for the cluster. Names of the controller nodes that are currently online. Names of the guest nodes that are currently online. Each guest node consists of a complex Bundle Set resource. For more information about bundle sets, see Section 4.3, “OpenStack Services Configured in Pacemaker”. Each IPaddr2 resource sets a virtual IP address that clients use to request access to a service. If the Controller Node that is assigned to that IP address fails, the IP address is reassigned to a different controller. In this example, you can see each controller node that is currently set to listen to a particular virtual IP address. In the output, each IP address is initially attached to a particular controller. For example, 192.168.1.150 is started on overcloud-controller-0. However, if that controller fails, the IP address is reassigned to other controllers in the cluster. The following table describes the IP addresses in the example and shows how each address was originally allocated. You can view details about a specific IP address that is managed by Pacemaker with the pcs command. For example, you can view timeout information or netmask ID. The following example shows the output of the pcs command when you run it on the ip-192.168.1.150 public IP address. $ sudo netstat -tupln | grep "192.168.1.150. *haproxy"
The ip command output shows that the vlan100 interface is listening to both the 192.168.1.150 and 192.168.1.151 IPv4 addresses. The netstat command output shows all processes that are listening to the 192.168.1.150 interface. In addition to the ntpd process that is listening at port 123, the haproxy process is the only other one listening specifically to 192.168.1.150. Processes that are listening to all local addresses, such as 0.0.0.0, are also available through 192.168.1.150. These processes include sshd, mysqld, dhclient, ntpd, and so on. The port numbers in the netstat command output can help you to identify the specific service that HAProxy is listening for. You can view the /var/lib/config-data/puppet-generated/haproxy/etc/haproxy/haproxy.cfg file to see which services these port numbers represent. Currently, most services that are defined in the haproxy.cfg file listen to the 192.168.1.150 IP address on all three controllers. However, only the controller-0 node is listening externally to the 192.168.1.150 IP address. Therefore, if the controller-0 node fails, HAProxy only needs to re-assign 192.168.1.150 to another controller and all other services will already be running on the fallback controller node. The majority of the services that are managed by the cluster in Red Hat OpenStack Platform 12 and later are configured as Bundle Set resources, or bundles. These services can be started in the same way on each controller node and are set to always run on each controller. A bundle resource handles configuring and replicating the same container on all controller nodes, mapping the necessary storage paths to the container directories, and setting specific attributes related to the resource itself. A container can run different kind of resources, from simple systemd based services like haproxy to complex services like Galera, which requires specific resource agents that controls and set the state of the service on the different nodes. Using docker or systemctl commands to manage bundles or containers is not supported. You can use the commands to check the status of the services, but you should use only Pacemaker to perform actions on these services. Docker containers that are controlled by Pacemaker have a RestartPolicy set to no by Docker. This is to ensure that Pacemaker and not the docker daemon controls the container start and stop actions. A simple Bundle Set resource, or simple bundle, is a set of containers that each include the same Pacemaker services to be deployed across the controller nodes. Docker: image=192.168.24.1:8787/rhosp12/openstack-haproxy:pcmklatest network=host options="--user=root --log-driver=journald -e KOLLA_CONFIG_STRATEGY=COPY_ALWAYS" replicas=3 run-command="/bin/bash /usr/local/bin/kolla_start"
The haproxy-bundle example also shows the resource settings for HAProxy. Although HAProxy provides high availability services by load-balancing traffic to selected services, you keep HAProxy itself highly available by configuring it as a Pacemaker bundle service. image: Image used by the container, which refers to the local registry of the undercloud. network: Container network type, which is "host" in the example. options: Specific options for the container. replicas: Number that indicates how many copies of the container should be created in the cluster. Each bundle includes three containers, one for each controller node. run-command: System command used to spawn the container. In addition to the Docker container specification, the bundle configuration contains also the Storage Mapping section, in which local path on the host are mapped into the container. Therefore, to check the haproxy configuration from the host, you open the /var/lib/config-data/puppet-generated/haproxy/etc/haproxy/haproxy.cfg file instead of the /etc/haproxy/haproxy.cfg file. The output shows that the process is running inside the container. The discovered parent pid attribute of the haproxy command (60956) can be used to search for the main Docker process that contains the ID of the Docker container (39238c5ecb77). This is the ID that is shown in the docker ps command output. You can run the same commands on any bundle to see the current level of activity and details about the commands that the service runs. Complex Bundle Set resources, or complex bundles, are Pacemaker services that specify a resource configuration in addition to the basic container configuration, which is also included in simple bundles. This additional configuration is needed to manage Multi-State resources, which are services that can have different states depending on which controller node they run. In the output, you see that unlike RabbitMQ, the Galera and Redis bundles are run as multi-state resources inside their containers. For the galera-bundle resource, all three controllers are running as Galera masters. For the redis-bundle resource, the overcloud-controller-0 container is running as the master, while the other two controllers are running as slaves. This means that the Galera service is running under one set of constraints on all three controllers, while the redis service might run under different constraints on the master and the slave controllers. Docker: image=192.168.24.1:8787/rhosp12/openstack-mariadb:pcmklatest masters=3 network=host options="--user=root --log-driver=journald -e KOLLA_CONFIG_STRATEGY=COPY_ALWAYS" replicas=3 run-command="/bin/bash /usr/local/bin/kolla_start"
This output shows that unlike in a simple bundle, the galera-bundle resource includes explicit resource configuration, which determines all aspects of the multi-state resource. Even though a service might be running on multiple controllers at the same time, the controller itself might not be listening at the IP address that is needed to actually reach those services. For more information about troubleshooting the Galera resource, see Chapter 6, Using Galera. In this case, the systemd service openstack-cinder-volume needs to be re-enabled. In other cases, you need to track down and fix the problem, then clean up the resources. See Section 7.1, “Correcting Resource Problems on Controllers” for details. The my-ipmilan-for-controller settings show the type of fencing done for each node (stonith:fence_ipmilan) and whether or not the IPMI service is stopped or running. The PCSD Status shows that all three controllers are currently online. The Pacemaker service itself consists of three daemons: corosync, pacemaker, and pcsd. Here, all three services are active and enabled. When a controller node fails a health check, the controller acting as the Pacemaker designated coordinator (DC) uses the Pacemaker stonith service to fence off the offending node. Stonith is an acronym for the term "Shoot the other node in the head". So, the DC basically kicks the node out of the cluster. The show --full listing shows details about the three controller nodes that relate to fencing. The fence device uses IPMI power management (fence_ipmilan) to turn the machines on and off as required. Information about the IPMI interface for each node includes the IP address of the IPMI interface (10.100.0.51), the user name to log in as (admin) and the password to use (abc). You can also see the interval at which each host is monitored (60 seconds). For more information on fencing with Pacemaker, see "Fencing Configuration" in Red Hat Enterprise Linux 7 High Availability Add-On Administration. HAProxy provides high-availability features to OpenStack by load-balancing traffic to controllers running OpenStack services. The haproxy package contains the haproxy daemon, which is started from the systemd service of the same name, along with logging features and sample configurations. As noted earlier, Pacemaker manages the HAProxy service itself as a highly available service called haproxy-bundle. Refer to the KCS solution How can I verify my haproxy.cfg is correctly configured to load balance openstack services? for information on validating an HAProxy configuration. In Red Hat OpenStack Platform, the director configures multiple OpenStack services to take advantage of the haproxy service. The director does this by configuring those services in the /var/lib/config-data/haproxy/etc/haproxy/haproxy.cfg file, because HAProxy runs in a dedicated container on each overcloud node. This example of HAProxy settings for the cinder service identifies the IP addresses and ports on which the cinder service is offered (port 8777 on 172.16.0.10 and 192.168.1.150). The 172.16.0.10 address is a virtual IP address on the Internal API network (VLAN201) for use within the overcloud, and the 192.168.1.150 virtual IP address is on the External network (VLAN100) to provide access to the API network from outside of the overcloud. HAProxy can direct requests made for those two IP addresses to overcloud-controller-0 (172.16.0.13:8777), overcloud-controller-1 (172.16.0.14:8777), or overcloud-controller-2 (172.16.0.15:8777). The options set on these servers enables health checks (check) and the service is considered to be dead after five failed health checks (fall 5). The interval between two consecutive health checks is set to 2000 milliseconds (or 2 seconds) by inter 2000. A server is considered operational after 2 successful health checks (rise 2). The director also enables HAProxy Stats by default on all HA deployments. This feature allows you to view detailed information about data transfer, connections, server states, and the like on the HAProxy Stats page. In this case, navigate in your browser to 10.200.0.6:1993 and enter the credentials from the stats auth row to view the HAProxy Stats page. For more information about HAProxy, see HAProxy Configuration (from Load Balancer Administration). For detailed information about settings you can use in the haproxy.cfg file, see the documentation in /usr/share/doc/haproxy-_VERSION/configuration.txt_ on any system where the haproxy package is installed (such as Controller nodes). In a high-availability deployment, Red Hat OpenStack Platform uses the MariaDB Galera Cluster to manage database replication. As described in Section 4.3, “OpenStack Services Configured in Pacemaker”, Pacemaker runs the Galera service using a bundle set resource that manages the master/slave status. When troubleshooting the MariaDB Galera Cluster, you can verify the hostname resolution. By default, the director binds the Galera resource to a hostname rather than to an IP address . Therefore, any problems that prevent hostname resolution, such as misconfigured or failed DNS, might prevent Pacemaker from properly managing the Galera resource. After you eliminate any hostname resolution problems, you can check the integrity of the cluster itself. To do so, check the write-set replication status on the database of each controller node. $ sudo hiera -c /etc/puppet/hiera.yaml "mysql::server::root_password"
$ sudo mysql -B --password="<MYSQL-HIERA-PASSWORD>" -e "SHOW GLOBAL STATUS LIKE 'wsrep_%';"
$ sudo mysql -B --password="<MYSQL-HIERA-PASSWORD>" -e "SHOW GLOBAL STATUS LIKE 'VARIABLE';"
$ sudo mysql -B --password="<MYSQL-HIERA-PASSWORD>" -e "SHOW GLOBAL STATUS LIKE 'wsrep_cluster_state_uuid';"
The following table lists the different wsrep_ database variables that relate to cluster integrity. The ID of the cluster to which the node belongs. All nodes must have an identical ID. A node with a different ID is not connected to the cluster. You can check this on any single node. If the value is less than the actual number of nodes, then some nodes have either failed or lost connectivity. Determines whether or not the cluster has been split into several components, also known as a partition. This is likely caused by a network failure. All nodes must have an identical value. In case some nodes are reporting a different wsrep_cluster_conf_id, check their wsrep_cluster_status value to see if it can still write to the cluster (Primary). Determines whether or not the node can still write to the cluster. If so, then the wsrep_cluster_status should be Primary. Any other value indicates that the node is part of a non-operational partition. If you can isolate a Galera cluster problem to a specific node, other wsrep_ database variables can provide clues on the specific problem. You can check these variables in a similar manner as a cluster check, which is described in Section 6.2, “Database Cluster Integrity”. States whether the node can accept write-sets from the cluster. If so, then wsrep_ready should be ON. States whether the node has network connectivity to other nodes. If so, then wsrep_connected should be ON. Summarizes the node state. If node can still write to the cluster (ie. if wsrep_cluster_status is Primary, see Section 6.2, “Database Cluster Integrity”), then typical values for wsrep_local_state_comment are Joining, Waiting on SST, Joined, Synced, or Donor. If the node is part of a non-operational component, then wsrep_local_state_comment is set to Initialized. A wsrep_connected variable with an ON value might also mean that the node is only connected to some nodes but not all nodes. For example, in cases of a cluster partition, the node might be part of a component that cannot write to the cluster. See Section 6.2, “Database Cluster Integrity” for details. If wsrep_connected is OFF, then the node is not connected to any cluster components. If the cluster and its individual nodes are all healthy and stable, you can check replication throughput to benchmark performance. You do this by checking the wsrep_ database variables, similar to Section 6.3, “Database Cluster Node” and Section 6.2, “Database Cluster Integrity”. $ sudo mysql -B --password="<MYSQL-HIERA-PASSWORD>" -e "SHOW STATUS LIKE 'VARIABLE';"
Each time any of these variables are queried, a FLUSH STATUS command resets its value. Benchmarking cluster replication involves querying these values multiple times to see variances. These variances can help you judge how much Flow Control is affecting the cluster’s performance. Flow Control is a mechanism used by the cluster to manage replication. When the local received write-set queue exceeds a certain threshold, Flow Control pauses replication in order for the node to catch up. See Flow Control from the Galera Cluster site for more information. The node cannot apply write-sets as quickly as it receives them, which then triggers replication throttling. Check wsrep_local_recv_queue_min and wsrep_local_recv_queue_max for a detailed look at this benchmark. As the value of wsrep_local_send_queue_avg rises, so does the likelihood of replication throttling and network throughput issues. This is especially true as wsrep_local_recv_queue_avg rises. Flow Control paused the node. To determine how long the node was paused, multiply the wsrep_flow_control_paused value with the number of seconds between querying it. For example, if wsrep_flow_control_paused = 0.50 a minute after last checking it, then node replication was paused for 30 seconds. If wsrep_flow_control_paused = 1.0, then the node was paused the entire time since the last query. Ideally, wsrep_flow_control_paused should be as close to 0.0 as possible. In case of throttling and pausing, you can check the wsrep_cert_deps_distance variable to see how many write-sets (on average) can be applied in parallel. Then, check wsrep_slave_threads to see how many write-sets can actually be applied simultaneously. Configuring a higher wsrep_slave_threads can help mitigate throttling and pausing. For example, if the wsrep_cert_deps_distance value is 20, then doubling wsrep_slave_threads from 2 to 4 can also double the amount of write-sets that the node can apply. However, wsrep_slave_threads should be set only as high as the number of CPU cores in the node. If a problematic node already has an optimal wsrep_slave_threads setting, then consider excluding the node from the cluster as you investigate possible connectivity issues. This method was implemented to allow Galera to start successfully in overclouds that use IPv6 (specifically, to address BZ#1298671). The pcs constraint show command shows any constraints on how services are launched. The output from the command shows constraints related to where each resource is located, the order in which it starts and whether it must be co-located with another resource. If there are any problems, you can try to fix those problems, then clean up the resources. From this output, you can verify that the galera-role attribute is true for all the controllers. This means that the galera-bundle resource runs only on these nodes. The same concept applies to the other attributes associated with the other location constraints. The second location constraint relates to the resource ip-192.168.24.15 and specifies that the IP resource runs only on nodes with the haproxy-role attribute set to true. This means that the cluster associates the IP address with the haproxy service, which is necessary to make the services reachable. The third location constraint shows that the ipmilan resource is disabled on each of the controllers. This section shows the constraint that enforces the virtual IP address resources (IPaddr2) to start before HAProxy. Ordering constraints only apply to IP address resources and HAproxy. All the other resources are managed by systemd, because each service, such as Compute, is expected to be able to support an interruption of a dependent service, such as Galera. This section shows which resources need to be located together. All virtual IP addresses are linked to the haproxy-bundle resource. A suspiciously large amount of services are failing from a specific controller. If services from a controller are generally working, but an individual resource is failing, see if you can figure out the problem from the pcs status messages. If you need more information, log into the controller where the resource is failing and try some of the steps below. Nov 22 09:25:55 overcloud-controller-0.localdomain cinder-volume: 2016-11-22 09:25:55.798 383912 WARNING oslo_config.cfg [req-8f32db96-7ca2-4fc5-82ab-271993b28174 - - - -...e future. Nov 22 09:25:55 overcloud-controller-0.localdomain cinder-volume: 2016-11-22 09:25:55.799 383912 WARNING oslo_config.cfg [req-8f32db96-7ca2-4fc5-82ab-271993b28174 - - - -...e future. Nov 22 09:25:55 overcloud-controller-0.localdomain cinder-volume: 2016-11-22 09:25:55.926 383985 INFO cinder.coordination [-] Coordination backend started successfully. Nov 22 09:25:56 overcloud-controller-0.localdomain cinder-volume: 2016-11-22 09:25:56.047 383985 WARNING oslo_config.cfg [req-cb07b35c-af01-4c45-96f1-3d2bfc98ecb5 - - - -...e future. Nov 22 09:25:56 overcloud-controller-0.localdomain cinder-volume: 2016-11-22 09:25:56.048 383985 WARNING oslo_config.cfg [req-cb07b35c-af01-4c45-96f1-3d2bfc98ecb5 - - - -...e future. Nov 22 09:25:56 overcloud-controller-0.localdomain cinder-volume: 2016-11-22 09:25:56.063 383985 INFO cinder.volume.manager [req-cb07b35c-af01-4c45-96f1-3d2bfc98ecb5 - - ...essfully. Nov 22 09:25:56 overcloud-controller-0.localdomain cinder-volume: 2016-11-22 09:25:56.146 383985 INFO cinder.volume.manager [req-cb07b35c-af01-4c45-96f1-3d2bfc98ecb5 - - ...essfully. When deployed with Ceph storage, Red Hat OpenStack Platform uses ceph-mon as a monitor daemon for the Ceph cluster. The director deploys this daemon on all controller nodes. Here, all three controller nodes (overcloud-controller-0, -1, and -2) are set to monitor the Ceph cluster (mon_initial_members). The 172.19.0.11/24 network (VLAN 203) is used as the Storage Management Network and provides a communications path between the controller and Ceph Storage Nodes. The three Ceph Storage Nodes are on a separate network. As you can see, the IP addresses for those three nodes are on the Storage Network (VLAN 202) and are defined as 172.18.0.15, 172.18.0.16, and 172.18.0.17. From the ceph -s output, you can see that the health of the Ceph cluster is OK (HEALTH_OK). There are three Ceph monitor services running on the three overcloud-controller nodes. Also shown here are the IP addresses and ports each is listening on. For more information about Red Hat Ceph, see the Red Hat Ceph product page. The Deploying an Overcloud with Containerized Red Hat Ceph guide provides instructions for deploying the type of highly available OpenStack environment described in this document. The Director Installation and Usage guide was also used for reference throughout the process. The following tables show the specifications used by the deployment tested for this document. For better results, increase the CPU, memory, storage, or NICs on your own test deployment. Most OpenStack services, other than storage, run on these controller nodes. All services are replicated across the three nodes (some active-active; some active-passive). Three nodes are required for reliable HA. Storage services run on these nodes, providing pools of Ceph storage areas to the compute nodes. Again, three nodes are needed for HA. Virtual machines actually run on these compute nodes. You can have as many compute nodes as you need to meet your capacity requirements, including the ability to shut down compute nodes and migrate virtual machines between those nodes. Compute nodes must be connected to the storage network (so the VMs can access storage) and Tenant network (so VMs can access VMs on other compute nodes and also access public networks, to make their services available). This switch must be able to connect the director system (undercloud) to all computers in the Red Hat OpenStack Platform environment (overcloud). The NIC on each overcloud node that is connected to this switch must be able to PXE boot from the director. Also check that the switch has portfast set to enabled. This switch must be configured to do VLAN tagging for the VLANs shown in Figure 1. 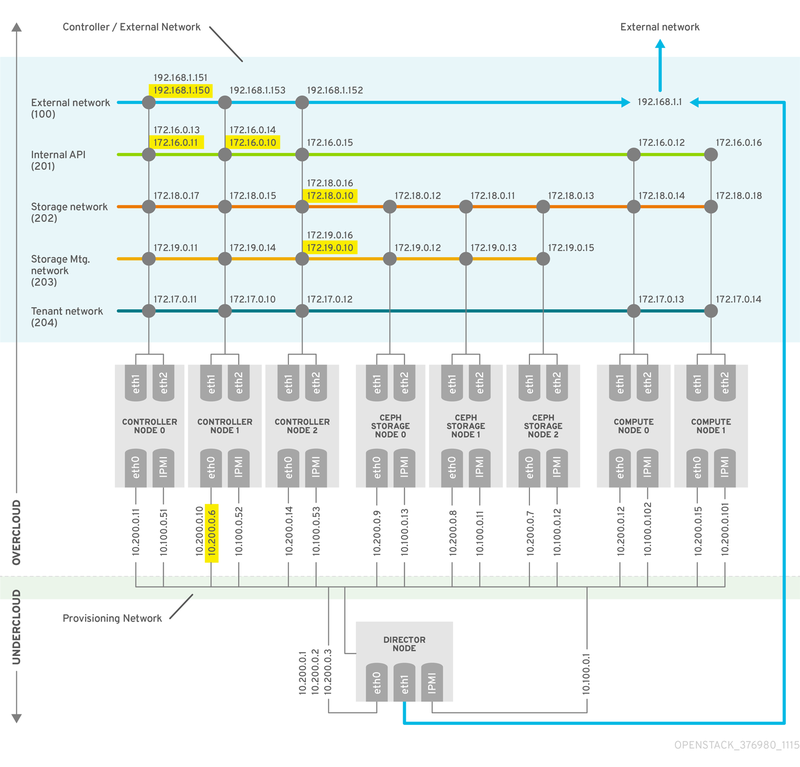 Only VLAN 100 traffic should be allowed to external networks. Hardware defined for use with Pacemaker is supported in this configuration. Supported fencing devices can be determined using the stonith Pacemaker tool. See Fencing the Controller Nodes for more information. This section shows relevant configuration files from the test configuration used for this document. If you change IP address ranges, consider making a diagram similar to Figure 1.1, “OpenStack HA environment deployed through director” to track your resulting address settings. The following configuration files reflect the actual overcloud settings from the deployment used for this document. This file identifies the services that HAProxy manages. It contains the settings that define the services monitored by HAProxy. This file exists and is the same on all Controller nodes. This file defines the cluster infrastructure, and is available on all Controller nodes. This file contains Ceph high availability settings, including the hostnames and IP addresses of monitoring hosts.